The best maze game since Pac-Man! These birds aren't angry, they're sleepy! Guide them home without being scared by the ghosts. Catch them in chains of matching colours for a perfect score. Use magic mushrooms to get revenge on the ghosts and rainbow flowers to sort your Snoozles into colour order. Watch the seasons change in the woodland as you play. 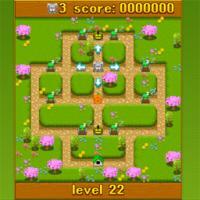 There's 75 levels, loads of powerups and cute characters in this fun and addictive game.